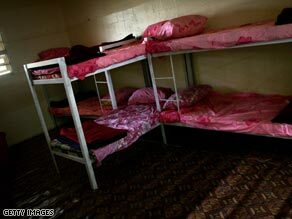 BAGHDAD, Iraq (CNN) -- The notorious Iraq prison once called Abu Ghraib has reopened under Iraqi government control. And the Ministry of Justice has launched a public-relations campaign to show it has changed since the days when prisoners were tortured there -- first under Saddam Hussein, and later by American troops. The Iraqi Ministry of Justice gave journalists an inside look at the prison formerly known as Abu Ghraib. It is now called Baghdad Central Prison, and has water fountains, a freshly planted garden and a gym -- complete with weights and sports teams' jerseys on the walls. Under Saddam Hussein, tens of thousands of Iraqis were thrown behind bars here. There were horrific stories of torture, abuse, execution without trial. Detainees were photographed in degrading positions, as Americans posed next to them smiling. The images -- naked prisoners stacked on top of each other, or being threatened by dogs, or hooded and wired up as if for electrocution -- caused outrage around the world when they were leaked to the news media in May 2004. Brig. Gen. Janis Karpinski, commander of the Abu Ghraib prison at the time, was demoted in rank to colonel because of the scandal. Seven low-ranking guards and two military intelligence soldiers -- described by then-U.S. Secretary of Defense Donald Rumsfeld as "bad apples" -- were disciplined after the scandal surfaced. Rumsfeld later said the day the scandal broke was the worst in his tenure as defense secretary. "Clearly the worst day was Abu Ghraib, and seeing what went on there and feeling so deeply sorry that that happened," Rumsfeld said shortly before leaving office at the end of 2006. "I remember being stunned by the news of the abuse." The United States always denied it was a matter of policy to torture detainees. But it shut down Abu Ghraib in September 2006 and turned the facility over to the Iraqis. They have revamped and reopened it. Rooms have been transformed and renovated. CNN was told, but not shown, that a few hundred prisoners are here already, in a revamped part of the facility that can hold up to 3,000 prisoners. The capacity is critical to help deal with overcrowding at Iraq's other facilities and the potential security threat. The Iraqi government is going to great lengths to try to change the image this facility has. It organized a tour for journalists, very carefully orchestrated by the Ministry of Justice. Murtada Sharif, the only Ministry of Justice official to speak to CNN on camera about the prison, admitted Abu Ghraib is synonymous in people's minds with the inhumane acts that took place there both before and after the fall of Saddam in 2003. "We want to change its image, to make it a place of justice," he said. A wing that used to hold a thousand prisoners In Saddam Hussein's time now is ready for 160. Cells that used to hold between 30 and 50 people now have a capacity of eight. Prisoners and their families actually get to see each other -- the prisoners behind a cage-like structure, the families on the other side of the fence, in a courtyard with a playground for the children. Again, it is part of the whole effort to create a different atmosphere. But human rights organizations in Iraq say abuse and torture remain routine in Iraq's detention facilities. Changing Abu Ghraib's infamous reputation may take more than fresh paint and fake flowers.